India with its incredible diversity is an amazing place for the wanderers. One can see that people in India are receptive towards diverse religions, race, culture, traditions and languages. They live together happily and peacefully without affecting each other’s feelings. It is believed that India is a land of festivals. One can hardly witness a place in India, that is not touched by the joy of the festivals. Ladakh, district of Jammu & Kashmir is no exception to this, as we can see a popular festival Losar in Ladakh. If one wants to be a spectator of such unique diversity combined with unity in the celebration of festivals is the right place to come across, as the festivals present a wonderful opportunity for one to share their customs and traditions. Tibetans were nomads that harmoniously coexist on Qinghai-Tibetan Plateau with harsh environment. Husbandry had been the unique style of living for Tibetans religious traditions. Their crops had bump harvest, they celebrate it in multiple ways, some dance while some people sing folk songs. As the time passed, they started to take the time till the highland barley ripes as a mark for thr beginning of New Year. Hence, Tibetan New Year presents the tourists, a wonderful opportunity to enjoy Losar, the annual festival with local Tibetans. Losar, is a Tibetan word. 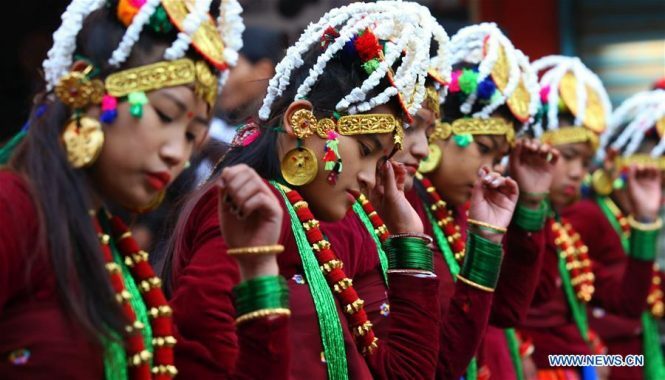 The Losar festival is a Tibetan festival, celebrated in Nepal, Bhutan and Tibet following one’s own traditions. It is noted to be the most important festival and marked as a beginning of the New Year. At the time of the festival, the Ladakhi/Buddhists offer prayers to the deities in the Gompas or the shrines. Feasting, Cultural events, rituals along with traditional dance performances and folk songs are organized during the festival. One can enjoy the dramas/stage-plays that differentiate the good from the evil. This gleeful ceremony, celebrated between the months of January and March, is referred to the beginning of New Year. 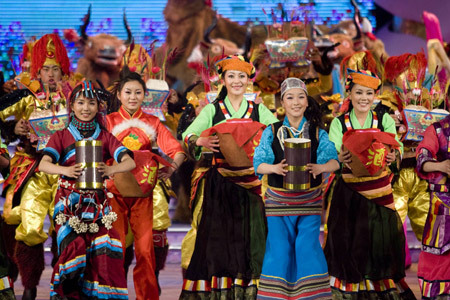 Losar is one of the most important vibrant festivals celebrated for a specific period, which lasts for two weeks (15days). Although there is no fixed date, they will be fixed according to the Lunar Calendar. The Losar remains a lifetime experience for its visitors. Losar begins with traditional monks of Jamyang Namgyal monastery offering prayers to the Goddess Palden Lhamo, protectors of Dharma. Along with the Dalai Lama, the dignitaries of various Buddhists attend the ceremony. 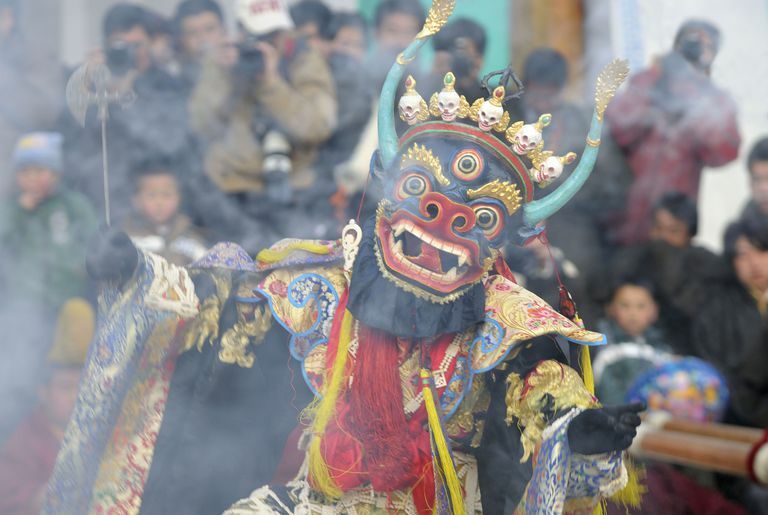 Losar is a colourful festival known for its uniqueness. Losar pre dates the commencement of Buddhism –Bon religion in Tibet. The tradition followed by spiritual ceremony is conducted every year in the winter. Later, this ceremony was changed into a yearly festival for Buddhists which starts during the time of ninth Tibetan king, PudeGungyal. At present time, Losar in Ladakh starts ahead of time from the date of the festival. On the Tibetan’s new year, some people do not drink champagne as part of celebration but the go to the local spring to offer prayers as a gratitude. Offerings are made to the Nagas, the spirit of water. A favourite drink is served, Chang (barley beer). The other traditions symbolize good harvest, called the phyemar, which is a five-grain bucket. The bucket contains Zanba and barley seeds, Zanba is also called tsamba. The preparation is done carefully, the rehearsals for the performances are taken care before the festival commences. People also clean their houses dumping the old and unused materials, so that one can ward the evil off their lives and attain peace. There are colourful flag decorations are seen in every corner and religious offerings called ‘Lama Losar’ are made. 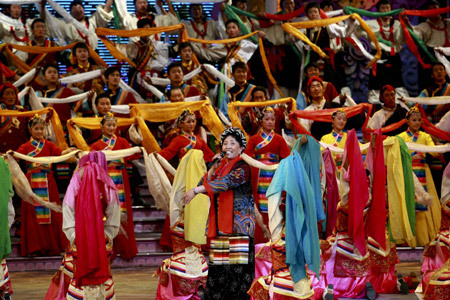 The Losar traditions are similar to Bhutan, distinct from its neighboring, Tibet. The celebration commenced in Bhutan in 1637, when Shabdrung Ngawang Namgyal commemorated the session of the Punakha Dzong, in which the ceremony was inaugurated “Bhutanese from all over the country came from various regions. Traditional foods taken on the occasion are green-bananas and sugarcane. The first three days are considered to be most important. On the first day, women wake up early in the morning to get their first water of the year, with which they use for preparing food and at night, families rendezvous for dinner and give presents to their loved ones. Kapse Cake and Chang (alcoholic drink) will be served for dinner. During the second day, people visit relatives. 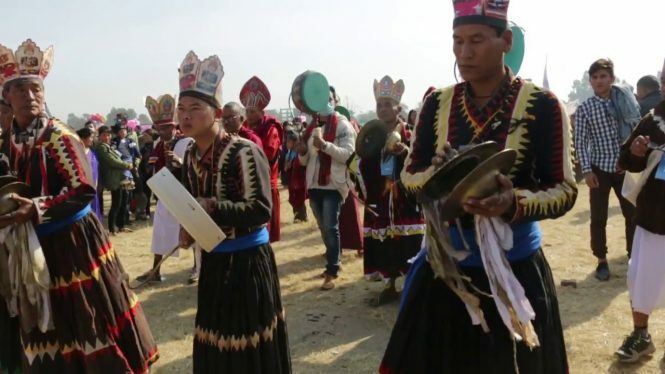 Tibetans take qemar, filled with barley power, fried barley, the straw of barley, flowers and tsampa made of yak butter are sent to their friends as New Year’s greeting. 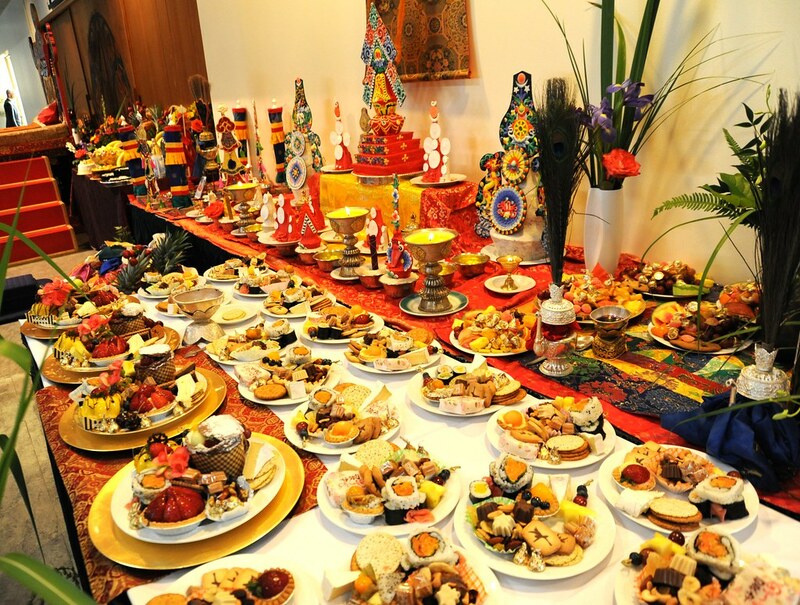 They sit down for drinking yak butter tea and other Tibetan delicacies which can be eaten only during the New Year Eve. On the third day, locals visit monasteries with offerings that are made with herbs along with that, Wei Sang, a burning pine tree branch and cypress are most essential on the third day of celebration besides Tibetans hang prayer flags, for peace and happiness. A Tibetan mirror is to greet people for their happiness, blessings and peace on New Year. The pilgrimage and heart of New Year start in a place, Lhasa. Travelling to the most perfect place at the right time is undoubtedly a great thing. 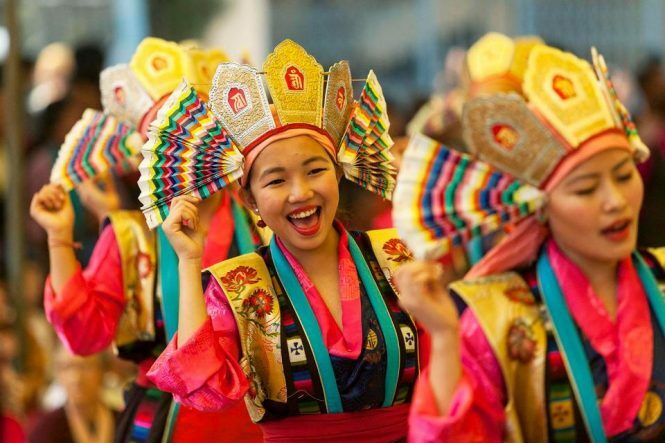 Taking the celebrations from Lhasa to diverse rituals to religious worship and most entertaining performances during the eve, Tibet Vista’s travelling to their gurus, give you the six top most places to wander in Lhasa as a widespread to the New Year celebration Tibetan. Domestic and International tourists should be visiting Tibetans when they happen to tour Tibet during Losar.